Reach Your Muscle Building Goals With A 15 Minute Workout Circuit! With our busy schedules sometimes it's hard to find the motivation to get to the gym. With this circuit program you can shorten your workout time and reach your goals! You can shorten your workout time commitment with sacrificing your goals. A circuit training program can help you pack on lean muscle mass. When circuit training be sure to keep the weights heavy. If there&apos;s one thing that often gets in the way of you and your workout, time is it. Finding the time to get into the gym three or four days a week for an hour, plus also get in a few cardio sessions as well can be incredibly trying for almost anyone. There definitely does come a time when you&apos;re going to have to choose between reaching your health and fitness goals and keeping up with all the other activities you want to pursue in life. Often a compromise will have to be reached. But, that said, there are plenty of ways that you can shorten your total time commitment to your workout without sacrificing your results entirely when your schedule does get busy. Obviously you don&apos;t want to be getting by on super-short workouts year round as that may hold you back from your overall training progress, but when time does seem to be an obstacle, having a fast yet effective workout that you can fall back on will really save the say. Let&apos;s take a brief look at what you should know in order to create a short circuit training program that will still allow you to pack on lean muscle mass and realize the goals you have set for yourself. Up With All The Other Activities You Want To Pursue In Life. Right off the start one of the most important things that you do want to ensure you do as you create your circuit training routine for muscle building is not ease up on the weight. A big mistake that far too many people make is thinking that since they are doing one exercise after another, this immediately means that they should decrease the weight they use. This is farthest from the truth. While you may not be able to lift as much as you would if you were taking 2-3 minute rest breaks between each exercise, don&apos;t go so light that you could easily complete 12-to-15 reps without a problem. If you do that you won&apos;t be challenging the muscles enough to even maintain your lean muscle mass, little own make actual muscle building gains. Is Not Ease Up On The Weight. One of the most effective ways to reduce the time commitment from your workout routine is to start combining exercises together. If you can pair two compound movements back to back, you&apos;ll be working so many muscle fibers in such a short period of time that your metabolism is going to really show significant increases and you&apos;ll also notice high levels of muscle building hormonal release. In addition to that, you&apos;ll also help the body battle against fatigue making you that much stronger than you were before. In the following workout program you&apos;re going to notice that the first exercise of each pairing does just this. You&apos;ll combine two movements together and then add a third exercise as the second one in the superset. Exercise As The Second One In The Superset. For the following circuit training program, you&apos;ll want to choose a weight that you find fatigues you at about the tenth rep of each pairing but not one so high that is causes you to sacrifice good form. What you&apos;re going to do is perform 4-to-5 rounds of each superset exercise with as little rest in between each as possible until all rounds have been completed. Then break for 2 minutes and move on to the next pairing and perform in the same fashion. Finally, no workout program would be complete without taking the time to factor in the cardio aspect of things. Just like you&apos;re hunting down a fast weight lifting routine, chances are you don&apos;t have the time to spend doing thirty minutes or more on the treadmill either. In this situation, one highly effective form of cardio that&apos;s really starting to catch on is called Tabata Training. With this protocol rather than doing your traditional longer duration cardio workout, you&apos;ll be working out for a total of four minutes. It really doesn&apos;t get much shorter than that. What you&apos;ll do for Tabata training is select one full body exercise such as a dumbbell squat, jumping jacks, deadlifts, or anything else you desire and perform it full out for twenty seconds. Once the twenty seconds are up, rest for 10 seconds and then go again. Repeat these 30 second intervals eight times to reach your four minutes and then you&apos;re done. These are incredibly quick yet the will send your metabolic rate through the roof so you&apos;ll continue to burn calories for hours after they&apos;re completed. TimeTo Factor In The Cardio Aspect Of Things. Also, since you aren&apos;t doing a great deal of volume with the circuit workout outlined above, you won&apos;t have to worry as much about overtraining if you do utilize a traditional weight lifting movement (such as the squat for example). Just keep in mind the point here is not to go for maximum weight so do lower the weight down from what you&apos;d normally use. So there you have the basic information you need to know in order to create a fast and effective workout when you need something on the go. Feel free to alter this program plan however you see fit to match both your own target muscle groups and your skill level. Some people may find they can&apos;t do the full ten reps of an exercise at the level they&apos;re and that&apos;s fine - work up to it but always make sure you maintain proper form. This is more important than anything else so it&apos;s an absolute must if you&apos;re going to see results. Implementing A Style Of Training - Power Circuit Training! Power Circuit Training is just an adaptation that can be done by anyone. We&apos;ve put together a detailed description right here including types of exercises and conventional and unconventional training routines. Read on and try them out! 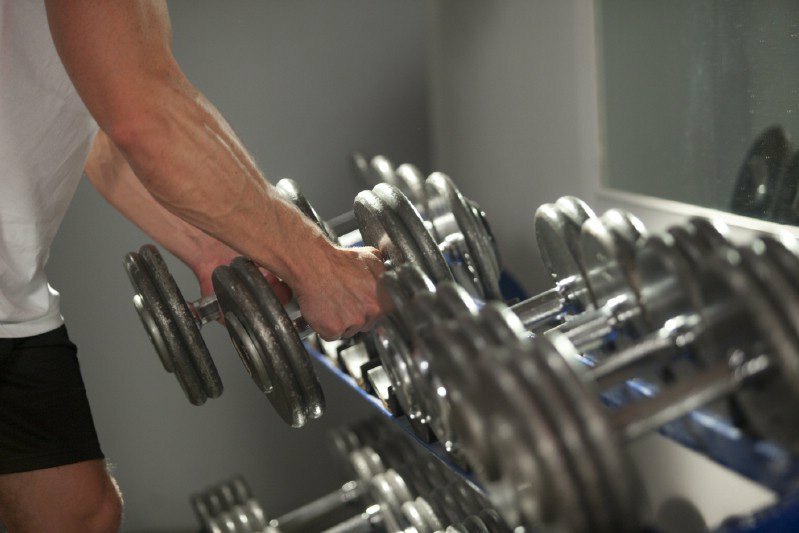 The Secret To Big Gains: Avoid Overtraining For Maximum Muscle Mass! Inadequate training frequency may be the greatest contributor to small gains. That&apos;s right, but there is more ... Learn how overtraining can effect you. Bonus: training methods to avoid overtraining!